By the mid-1920s, the power requirements of the GE District (former Great Eastern Railway) were becoming critical. There was a particular shortage of suitable locomotives for hauling express passenger services which had become heavier with increasing traffic and the introduction of heavier vacuum-braked coaches. Due to the limitations of the GER loading gauge, suitable locomotive types could not be transferred from other parts of the LNER system. Some of the K2 2-6-0 locomotives displaced older types, but they were not really suitable for the immediate heavy passenger needs. The shortage came to a head immediately after the General Strike (1926) when a shortage of quality coal led to appalling engine performances and the virtual failure of a number of stopping services on the Cambridge and Southend lines. LNER Management quickly ordered Gresley to produce a 4-6-0 design to supplement the existing B12s on the heavier passenger services; and a new 2-6-4T design for the Southend services. The 2-6-4T plan would eventually be dropped by the end of 1927 and replaced with an order for ten B12s. The initial specifications were for a three-cylinder 4-6-0 borrowing the cylinder and motion arrangement of the D49 4-4-0 with a tractive effort of about 25,000lb and the axle loading restricted to 17 tons. Doncaster had many problems satisfying this specification. One drawing included a tapered boiler and fluted brake hangers in order to reduce weight. Parts of the B16 4-6-0 front-end also crept into some of the later Doncaster drawings. The Locomotive Running Department was not satisfied with the resulting drawings, and the contract was handed to the the North British Locomotive Co. (NB Loco Co.) in December 1927. Most of the original Doncaster drawings were destroyed. On 14th February 1928, the NB Loco Co. presented two designs with 18 ton and 19 ton axle loadings. Although neither design met the initial requirement of a 17 ton axle loading, the 18 ton design was chosen. The LNER accepted that this would restrict the B17's route availability to "certain GER main lines" and not the full range which was originally intended. On 17th February, an initial order for ten locomotives was placed. The final B17 design borrowed many features from a batch of A1 Pacifics which the NB Loco Co. had built in 1924. The cab, cylinders, and motion had all been copied directly or slightly modified. Most of the boiler design was taken from the K3 2-6-0 and O2 2-8-0 designs. 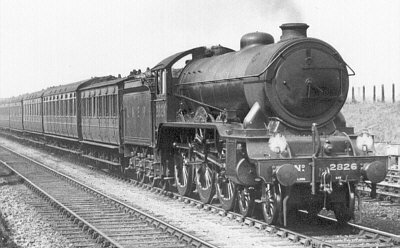 The LNER quickly ordered some modifications, including an increase in cylinder size from 17in to 17.5in, and a lengthening of the firebox by 5in. It was impossible for all three cylinders to drive the middle coupled axle, so the middle cylinder powered the leading axle and was positioned forward above the front bogie. The first B17 was delivered on 30th November 1928. Between 1930 and 1936, Darlington would produce 52 B17s in five batches. A final batch of eleven would be built by Robert Stephenson & Co. in 1937; resulting in a total of 73 B17s built. Small modifications were made to successive batches, resulting in four class parts (B17/1 to B17/4). The first members of B17/1 had a number of teething problems with cracked frames. In an attempt to fix this, the B17/2 locomotives were built with lighter springing on their driving axleboxes and stiffer bogie springing. Fractured frames continued to plague the B17s, so the B17/3 locomotives were fitted with horn blocks for the middle driving axle rather than guides. The spring arrangement was further amended and the axlebox lubrication mechanism was changed. Although this sequence of development led to a number of changes to the spring arrangement, the B17s would always have a reputation of being rough riders. The final B17s to be built (class B17/4) were intended for routes with few length restrictions, so they were produced with the larger 4,200 gallon LNER Group Standard tender. In 1937, Parts 1, 2, and 3 were merged to form the new class B17/1. These had 3700 gallon GE tenders. Class B17/4 continued to indicate B17s fitted with LNER Group Standard 4200 gallon tenders. The first locomotive, No. 2800, was named Sandringham starting a line of B17s named after English country houses. Starting with No. 2848, some of the B17s were named after Football Association clubs. Although some locomotives would be re-named, all 73 B17s bore a name. The first B17s ran the Cambridge services, where they were popular locomotives with both the public and the railwaymen. Rarely-named black 4-4-0s had been replaced with named green 4-6-0s! The Colchester line showed some teething problems including a major derailment, but the enginemen quickly grew to like these new locomotives. The services from London to Ipswich were not such a great success. This line had a number of banks which caused problems for the heavier trains. Throughout their lives, the B17s would continue to be more popular with the Cambridge crews than with the Ipswich crews. As more B17s were delivered, they would work more services including the cross-country service from Ipswich to Manchester. They were also a popular choice for East Anglia's heavy boat trains. Later B17s from 1936 with the larger tenders were allocated further afield to Leicester, Sheffield, Neasden, and Gorton. The Sheffield and Leicester B17s replaced older Great Central Atlantics. Although much more powerful, the B17s were never very popular at these sheds. After the outbreak of World War 2, the Great Central District B17s would move to East Anglia. The B17s would become restricted to the GE District for which they were designed. On a number of occasions in the late 1930s, building B17s for the North Eastern District was considered. However it was always decided to build either K3 2-6-0 or V2 2-6-2 locomotives instead. Both types were more powerful and considered more useful for the North East. In September 1937, Nos. 2859 & 2870 were given A4-style steamlining for working the "East Anglian" service from Liverpool Street to Norwich. These B17s would be given the classification B17/5. This streamlining was for show only, and served no practical purpose at typical B17 speeds. Also, the streamlining actually fitted over the existing boiler cloth plates, so avoiding damage to the lagging around the barrel. The streamlined appearance was enhanced by fitting side sheets to the tenders. Also, as with the A4s, chime whistles were fitted. Both the valences and chime whistles were removed during World War 2, and the streamline cladding itself was removed in April 1951. From August 1943, the boiler pressure was reduced to 180psi as a war time efficiency. In 1939, Gresley proposed an improvement to the B17 Diagram 100 boiler with an increase in working pressure to 220psi and the addition of thermic syphons to the firebox. The proposal was cancelled at the end of 1939, but Thompson created his own "improved B17 boiler" in the form of the Diagram 100A boiler for his standardised B1 4-6-0. These were designed to operate at 225psi, but did not include the thermic syphons of Gresley's earlier modification. Between 1943 and 1958, a total of 55 of the B17s would receive the Diagram 100A boiler, and these modified locomotives would receive the classification of B17/6. The B17/6 locomotives kept their three-cylinder arrangement, but between 1945 and 1947 Thompson rebuilt nine B17s to use the Diagram 100A boiler and have two cylinders. These two-cylinder rebuilds were classified B2. Although the B2s showed an improvement in efficiency and power compared to the original B17s, the B17/6s (B17s with Diagram 100A boilers) were shown to slightly outperform the B2s and only one further rebuild would occur (after Nationalisation, in 1949). The first three B17s were withdrawn between 1952 and 1953. The remaining B17s were withdrawn between 1958 and 1960. The first column covers parts 1 through 5. Quoted axle load is for classes B17/1 & B17/2. Classes B17/3 & B17/4 had a maximum axle load of 18 tons 7 cwt, and class B17/5 had a maximum axle load of 19 tons 16 cwt. Engine weights were 76 tons 13cwt (B17/1, B17/2); 77 tons 5cwt (B17/3, B17/4); 80 tons 10cwt (B17/5); and 77 tons 3cwt (B17/6). From August 1943, the parts 1 through 5, had their quoted boiler pressures reduced to 180psi. This was accompanied in a reduction of the tractive effort to 22,842lb. From November 1945, both boiler types (100 and 100A) had their tubes reduced from 143 to 141, resulting in a reduction in surface area from 1048 to 1033 sq.ft. (2020 to 2005 sq.ft., total). Heating Surface: Total: 2020 sq.ft. 2005 sq.ft. Firebox: 168 sq.ft. 168 sq.ft. Grate Area: 27.5 sq.ft. 27.9 sq.ft. The last B17s were withdrawn in 1960, and none survived into preservation. Many of the engine plaques from the "Footballer" locomotives were given to their respective football clubs. Hornby sell a OO gauge ready-to-run model of the B17. Crownline, PDK, and Golden Arrow Products all sell kits of the B17 in 4mm scale. Dean Sidings produce a resin body kit of the streamlined B17/5 in 4mm scale. Cornard, Jameson, and McGowan have produced kits of the B17 for 4mm scale, but they are currently unavailable. Dapol have recently released a ready-to-run B17 for N Gauge. O gauge (7mm scale) kits of the B17 are available from ACE Products, DJH, and DMR. Some of the B17s had two names, and these are listed with the date of the renaming. No. 2870 also carried the name Tottenham Hotspur from May 1937 to September 1937. This makes the above photographs (especially the Hoe St Walthamstow photograph from the DC Butler Collection) particularly rare. The naming ceremony of No. 2848 Arsenal by Lord Lonsdale in 1936 was filmed. The film can be viewed on the British Pathe website. Thanks to Dennis Butler for the photograph of No. 2826 Brancepeth Castle, and No. 2870 Tottenham Hotspur. The photograph of No. 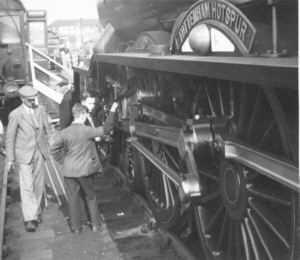 2870 features Dennis' friend Bob Todd (lad, facing the cylinder), who was a leading authority on the LNER in later life. From the DC Butler Collection, this photograph has also been published in a Tottenham Hotspurs programme. Thank you to Malcolm Peirson for the works photograph of No. 2870 Tottenham Hotspur. Thank you to the P.H. Groom collection for permission to use the above photograph of B17/6 BR No. 61621. Thank you to the Mike Morant Collection for the photograph of B17/5 No. 2859 East Anglian.